Mythic Games has been known for going big. Their Mythic Battles: Pantheon had huge miniatures. The Solomon Kane Kickstarter campaign opened several stretch goals and a campaign that takes at least 60 hours. Now Mythic Games wants to bring a World Weird War game to the tabletop, but with a big action feel. That game, Reichbusters: Projekt Vril, is now funding on Kickstarter. I got to ask Az Drummond of Mythic Games eight questions to find out more about this game. Why set Reichbusters in a World Weird War setting instead of World War II? At Mythic Games we are always keen to push the boundaries of what is real and what is fantasy, mythical or epic. We’ve seen weird world war games done before of course and we felt we could add something really exciting to this genre. 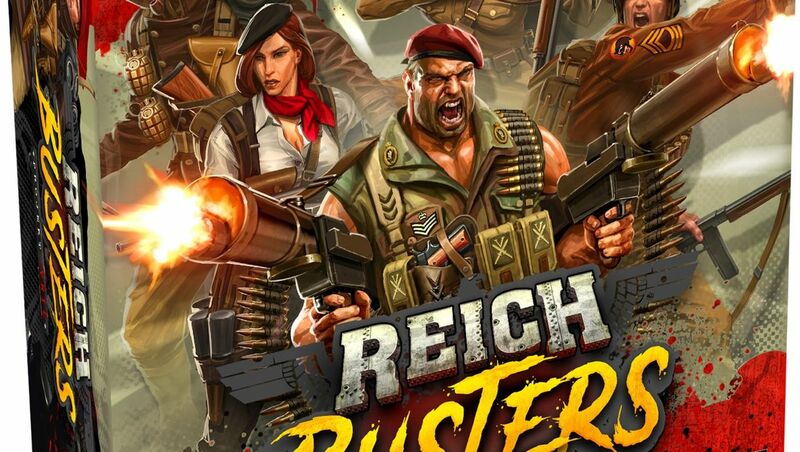 Reichbusters is a game that doesn’t take itself too seriously and we wanted to make that really clear from the start with our teasers as we showed off the exaggerated Hero poses, vril technology and dastardly looking Nazi officers. Going with an alternate history game allowed us to inject our creativity into the world and define a really compelling look for our heroes and villains. This translates directly onto the tabletop too as we can create fantastical and gorgeous miniatures which capture player’s imaginations. We’re also able to tell our own stories and if Reichbusters is well received we’d love to see just how far we could take the characters and especially the technology that vril would have unlocked during this time period. How did you come up with the design of some of the enemies encountered throughout the campaign? We first wanted to ground the game in real World War II imagery while still adding that over-the-top flair that the game has, so we initially designed soldiers, guard dogs, monocle-wearing officers and the core elements that many gamers would recognise. When it came to the vril empowered enemies we agreed early that we wanted a Vrilmeister (nazi boss) to be leading each aspect of the research and experimentation into vril such as Mechanical, Biological, and then onto Alien later in the design. Our game development team outlined the core concepts of each unit the wanted to have in the game and then we let our artists run wild with concepts before deciding on the final version of each enemy. Deciding on the mechanics or feeling of a unit before moving to art and sculpt really helps to ensure the look and feel of the game is consistent. We used primarily a single artist, Guillem H. Pongiluppi, who we’ve worked with on several projects now as we really knew he could capture the darkness and evil looks of the Nazi units. You have a full campaign, but players have the ability to create raids for a single session play. How are raids created? The RAID mode really is the main way you can play Reichbusters: Projekt Vril. Each time you sit down to play you’ll be able to choose a Map, a Mission, a Vrilmeister Faction to face and then finally a “Team” for your Heroes. These options will be placed on cards forming decks for each of the four choices so you can either make up your own combination or randomise it completely. You’ll also have customisation options for your Heroes themselves with weapons, skills and items which can be exchanged during the pre-mission R&D phase. How many missions will be included in the campaign? In the Core Box there will be 6 missions that can be played in an ongoing campaign. We will also have 4 additional missions in the “Not of this Earth” expansion plus 1 extra mission in the Projekt X mini-expansion. Will objectives change during the scenario? Your initial objective or objectives will be set at the beginning of each mission, however depending on how the mission goes, what rooms you investigate or enemies you come across, new paths and objectives can present themselves mid-game. This is especially important in the Campaign which will see the outcomes of previous missions really impact future missions. Will the game always have a set of four characters for the scenario even when there are less than four players? Reichbusters: Projekt Vril will be playtested and balanced primarily around 2, 3 or 4 Heroes being taken on each mission. This means while you can play Reichbusters with only one Hero, we recommend taking at least two for the best gameplay experience. Players can easily play more than one Hero, but because we wanted real flavour and asymmetry between each of the Heroes and their Action Card decks, it will require extra levels of planning and skill to play more than one Hero. Why use area movement instead of something grid or hex based? We actually started with a grid layout and really enjoyed the flexibility it gave us with the board and the finesse it offered with things like Line-of-sight and cover. However as we developed the game more, we found elements of the rules were getting in the way of the big heroic moments we were enjoying so much. Area-based tiles give us the best of both worlds with fast and simple movement but also the ability to design really varied maps to represent the castle and bunkers of the Vrilmeisters research labs. Do you see the world of Reichbusters expanding beyond this game with expansions or other projects like books? We’ve actually already been approached by some companies interested in exploring the world of Reichbusters with us, so it’s already firmly in our minds. As ever we’re a company that really listens to our community so we’ll gauge the response to Reichbusters: Projekt Vril, listen to the feedback and ideas that generate through the excitement of a Kickstarter campaign and then go from there. Just looking at the box, art, and figures of Reichbusters, you can tell they want to go big with the game. I get the feeling of Gears of War when I take a look at the game, but without the hand management controlling your health. So if you’re ready to take down some Nazi scum, then go and give Reichbusters a look.